Save $34.90 or get free license key DriverMax Pro. It’s a short time free offer for new version the driver tool. Get DriverMax 9 Pro serial key for free after registration. The software will active for one year since it activated. 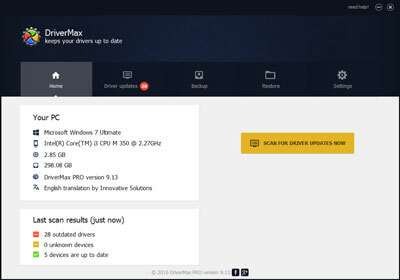 DriveMax is a tool for updating computer drivers automatically. It found on the free and pro version but on the paid version you can get better detection and automatic update. The best paid versions is lifetime but on this offer you can get 1-year license active only. You can follow these steps to get the software for free. And get money saving $34.90 on this offer. The get the free activation code, open giveaway page above (German language). Enter name and email address then click “Absenden” to send your request. You’ll then receive the code and download link in your email. Download and install the software on your PC. Then activate it using the code received in your email. Your computer must connect to internet to validate the code. Every users will receive unique code. So, make sure your activation code still private. Like other free offer, there no free technical support and upgrade for free software version. After the offer expires, you can buy the software using DriverMax coupon code. The benefit, you can get free support and update.